The TALEXXengine STARK DLE TWIST is the first LED light engine in the Tridonic LED portfolio with an integrated converter and a holder for luminaire installation mounted on the heat sink. Like conventional light sources, this compact high-efficiency LED unit can be installed without any tools and can just as easily be dismantled. Dornbirn, Austria – The LED light engine combines an LED light source, converter and the appropriate holder for luminaire installation in a single casing. It has an impressive colour rendering index of more than 80 and a high system efficiency of 60 lm/W at a colour temperature of 3000 K and 70 lm/W at 4000 K, each for a typical Tc point temperature of 65 °C. The 4000 K version (70 lm/ W) achieves energy savings of around 35 % compared with compact fluorescent lamps, and up to 60 % compared with low-voltage halogen lamps. Since all the components of the LED unit come from Tridonic there is a five-year guarantee on the complete system. Installation and dismantling could not be simpler. The holder is mounted on the heat sink and then the LED unit is simply screwed into the holder – just like an ordinary light bulb. This provides the thermal, mechanical end electrical connection and the product is ready for use. A spring ensures permanent contact between the light engine and the surface of the heat sink. This means that heat is properly removed, thereby ensuring the long life of the LED unit. A white diffuser and the overall neutral appearance of the light sources ensure uniform distribution of the light. Standardised lumen packages enable a constant luminous flux to be provided and therefore precise sustainable lighting planning throughout the entire life of the unit of 50,000 hours. 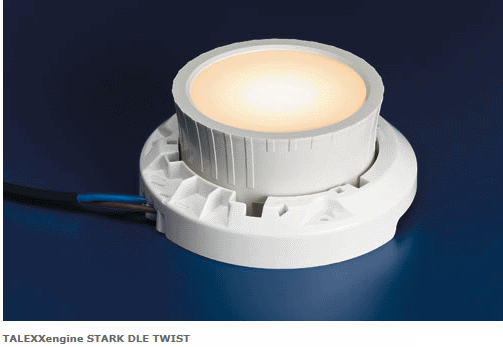 TALEXXengine STARK DLE TWIST is currently available in the CLASSIC version (non-dimmable) with a luminous flux of 1100 lm and colour temperatures of 3000 and 4000 K. It is particularly suitable for downlights for general illumination tasks and, depending on the colour temperature, provides impressive service in the retail, presentation, restaurant, hotel and wellness sectors. The LED unit can be used as a replacement for 13 W, 18 W and 24 W compact fluorescent lamps and 50 W halogen lamps. A version with 2000 lm will be added to the product portfolio this year, with more to follow. The light engine is already equipped for the future because the LED module uses proprietary connection technology for simple replacement so the imminent 2000 lm version for example can be swapped in easily. The connection technology complies with the planned standards of the Zhaga Consortium which aims to ensure compatibility between different LED products. This means that future LED light sources with different lumen values and wattages can be easily integrated in existing lighting systems.